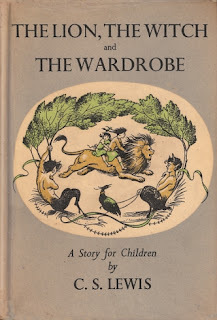 The Narnia series is probably one of the only series of stories which my children not only ask to read over and over again (even when it is not the month of July) but that when we do read it, they ask for multiple chapters at a time. One or two chapters is never quite enough. Gladly, we all agree in our love for Narnia which makes reading about it a pleasurable experience for all. No other book series is so full of imagination, provocative thought, and/or registers such a deep range of emotions for me. Every time I enter into the land of Narnia I find myself challenged in some form or fashion. It's a marvelous series and one I am so happy to be able to share with my children. It makes me glad that they love it just as well as I do. As we read along I inevitably find myself pausing over particular passages. Sometimes I have to stop reading as a result of becoming choked up. You might accuse me of being too engaged with the story and if that is a sin then I've definitely guilty. Narnia is a real place to me and I love its people well. 1. Edmund has just met the White Witch and tasted her Turkish Delight. She is sending him back to his own world with the instruction to return with his siblings. "Please, please," said Edmund suddenly, "please couldn't I have just one piece of Turkish Delight to eat on the way home?" "No, no," said the Queen with a laugh, "you must wait till next time." Sin is so tempting. It is so "tasty", isn't it? We commit it because, in some form or fashion, we find it pleasurable. Edmund was engaging in a bout of pride with the Witch. He fancied himself more important than his siblings and worthy of the Queen's attention. But he didn't just want her attention - he wanted her position. He was filled with envy and greed for what she had: a castle, a land, the perceived right to rule the land. And then she had the ability to magically create Turkish Delight. A little taste of her dark magic food and he wanted everything that she possessed and more. He tasted just a little bit of untruth and found it satisfying. He wanted more. He wanted just one more sample of lies "to eat on the way home." Once we give into sin, tasting it and finding it momentarily delightful, we want more. Always more. 2. The next passage that caught my eye was when the four children are all newly in Narnia and have discovered that Mr. Tumnus has been taking captive by the White Witch. They are standing in the woods trying to decide what to do when they spy Mr. Beaver who is trying to get the kids' attention. They can't quite make out who or what he is though. "I saw it that time too," said Peter. "It's still there. it's just gone behind that big tree." "What is it?" asked Lucy, trying very hard not to sound nervous. "Whatever it is," said Peter, "it's dodging us. It's something that doesn't want to be seen." "Let's go home," said Susan. Susan's attitude epitomizes one that is so prevalent in Christian circles these days. Are things getting hard? Getting dicey? Becoming difficult? Let's run away. Pretend it's not happening. Say nothing. Do nothing. Maybe it'll go away. Susan's response is one of timidity and fear, not of courage and bravery. When the going gets even slightly hard there is sometimes a temptation to turn the other way and go home. We tend to want to get ourselves to some place safe. But where in scripture are we promised a life of safety and ease? On the contrary, we see countless examples in scriptures of people facing hard choices and decisions and being forced to cling to God, the hope of their salvation. When we face these challenging moments in life (which seem to be coming at Christians at a faster and faster pace these days) we aren't created or meant to turn around and flee. Don't be a Susan in these times. Be a Peter! Be a Lucy! We have to do what's right even in the face of fear and/or opposition. We've been called to live a glorious life, not a timid one, hiding out in our "safe places." Live to the hilt whatever situation. Quietly they whispered, "Let's sail back to the life we knew"
Burn the ships, Susan! Follow that Beaver! I love this post, especially the last point. Maybe my children and I will revisit Narnia again this month after all. You've shared two of my favorite songs ;) I love this review! Great thoughts! You are making me want to revisit Narnia :) Ah, yes, "burn the ships".....I get that! I enjoyed your thoughts on The Lion, The Witch and The Wardrobe! That one has remained my favorite Narnia book, but I haven't finished reading them all yet. The Silver Chair (which I am currently reading) has reintroduced Narnia to me all over again, almost as if it were the first time -- loving it! I hadn't noticed before how out of the blue that is, how not connected to what was otherwise going on. Good thoughts!